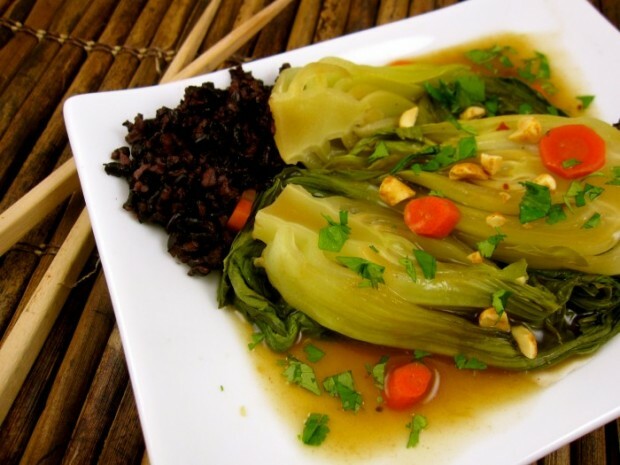 Here’s a healthy, vegetarian recipe to usher in the Chinese New Year on Monday. When I’m craving food with a lighter touch, I often turn to braising or steaming. I didn’t use so much as a drop of oil when making tonight’s dinner. Braise bok choy and carrots in a simmering brew of Asian condiments and chicken stock. Remove bok choy and whisk cornstarch-rice wine vinegar into brew to thicken. Rice sops up the sauce in the recipe. My main regret with the recipe is I didn’t have shiitakes to add; their flavor is marvelous when paired with oyster sauce. I make another recipe similar to this that incorporates tofu, if you’d like a punch of protein in your dish. In a deep-lipped saucepan or wok large enough to accommodate the bok choy, bring stock, soy and oyster sauce to a simmer. Add bok choy, bring to a simmer again and cover for 4 minutes. Add carrots and simmer an additional 2-4 minutes, depending on size of bok choy, or until bok choy is just tender. In a small bowl, whisk the vinegar and cornstarch until smooth. Remove bok choy from stock and then whisk the cornstarch mixture into the seasoned stock; stir in red pepper and ginger. Continue to simmer until mixture has thickened. Reheat bok choy in the sauce. Serve bok choy with rice and sauce and sprinkle dish with chopped cilantro and peanuts, if using. More Recipes Filed Under "One-pot-chop"